The far right is active in Poland and Ukraine football. Dutch black players were the victims of monkey chants whilst they trained for the Euro 2012 tournament in Krakow on Thursday, prompting captain Mark van Bommel vowing to take the issue to UEFA. Mark van Bommel, the captain of Holland has vowed to complain to UEFA after his black teammates were taunted with monkey chants whilst they were training in Krakow, Poland, on Thursday. Van Bommel referred to the monkey chants as “a real disgrace”, and vowed to take the matter to UEFA. When former England defender, Sol Campbell warned black and minority ethnic England supporters not to travel to Poland or the Ukraine for the Euro 2012 tournament because of fears that they might be racially attacked, he went as far as to say that they could come back in body bags. His warnings followed a Panorama documentary into football racism in the Ukraine, where images of fans displaying Nazi salutes and taunting black players with monkey chants made for uncomfortable viewing. When you consider that FIFA and other football bodies claim to be tackling racism in the sport granting Poland and the Ukraine the Euro 2012 tournament sends a contradictory message. However, black and minority ethnic football fans need to realise that just like any major sporting event, football is big business, and any claims that racism is being fought is arguably good public relations and nothing more. In other words this was a political move by UEFA, and race was not on the agenda. Note also how businesses are cashing in. This is the reality of major sporting events which has become cash cows for big business. It would have been objective if Panorama had taken a closer look at football in England as well because things are not as rosy as it seems. Whilst the football governing bodies are careful to keep racism under control in the Premiership and major football leagues where the media and public attention is substantial; it is the lower leagues where you will find the real picture of race relations within football in this country. In my article Racism will probably never be kicked out of football as long as punishments are lenient, I mentioned John Mann, a Labour MP and Leeds supporter, who told The Times in May 2009 that racist and religious abuse incidents in football matches within England is a problem, and that there were disturbing levels of racism and religious intolerance at junior and amateur clubs as well as the lower grassroots level of football. According to Yahoo Sport, Italian striker Mario Balotelli said he would walk off the pitch if he is racially taunted, yet UEFA President Michel Platini warned that any player who leaves the field because of taunts will be given an automatic yellow card. 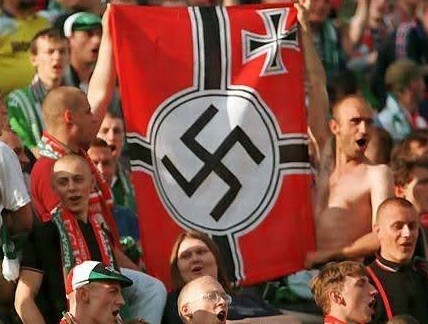 The message is clear by UEFA, it will be business as usual and racism will not stop the tournament. The only thing thing referees have been instucted to do by UEFA in light of racist taunts is temporarily halt the game; but nonetheless the games will go on. The black football players at Euro 2012 and any other player who care to make a stand could stage a mass walkout if events take a turn for the worse, but eventually it comes down to what is more important for each individual player, playing for their country or combating racism. This entry was posted in Sport and tagged Dutch black players were the victims of monkey chants, Panorama documentary into football racism in the Ukraine, Sol Campbell warned black and minority ethnic England supporters not to travel to Poland or the Ukraine for the Euro 2012 tournament. Bookmark the permalink.